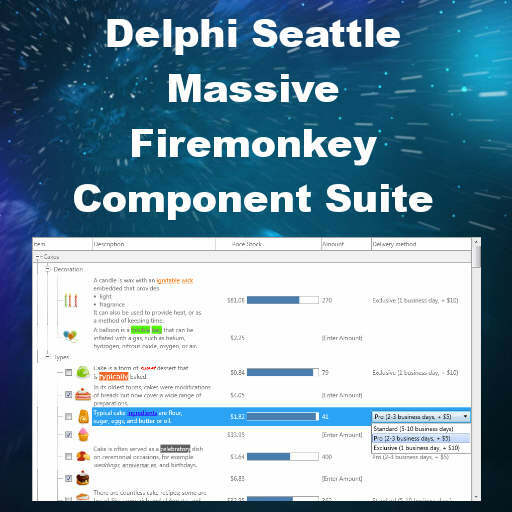 TMS Software has released another massive update to their TMS Pack for Firemonkey component suite with Delphi Seattle support. The upgraded component suite includes some really awesome looking components including a new high performance virtual treeview with a huge number of features. Other new components include a directory treeview, a checkbox treeview, and a scrolling hierarchical structure control. These components should mostly all support Android, IOS, OSX, and Windows. Two new controls that only support Windows and OSX are a virtual keyboard control and a popup virtual keyboard control to give your touch screen desktop device apps a keyboard interface. If you aren’t familiar with the rest of the component suite it has at least over 50 other controls with everything from HTML labels to cross platform web browsers to listviews and treeviews and tableviews. You can read more about it in our previous posts here, here, and here. These components should work with Appmethod and C++Builder with only a few minor install tweaks. This is also a commercial component suite and there is a free trial available. Head over and read all about the various components in TMS Pack for Firemonkey before downloading the free trial.